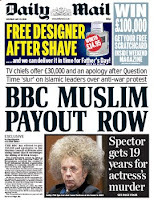 Tabloid Watch: Mail heaven - attacking Muslims and the BBC in one story! Mail heaven - attacking Muslims and the BBC in one story! A man on a political discussion TV show makes a false claim about an organisation. The organisation complains. The broadcaster offers to apologise (and perhaps pay damages). You would not think there could be much cause for complaint about that. Except when the broadcaster is the BBC and the organisation is a Muslim one. So the Mail has splashed the story on its front page. Because that's YOUR licence fee that may be going to them Muslims if that £30,000 is paid. At the moment, it says that is an just an 'offer' and the BBC says: 'No final settlement has been reached'. So that £30,000, which is not mentioned on the BBC news version, may not even be accurate (and probably isn't). None of which stops the Mail comments pages being over-run with all the usual remarks attacking the BBC and Muslims. It includes lots of 'What happened to freedom of speech? '-type statements, which were noticeably absent when those attention-seeking Luton protestors disrupted a sopldier's parade. One commentator (Paul Hunt, Uk, 29/5/2009 22:26) says: 'And politicians scratch their heads wondering why the BNP are doing so well'. He doesn't seem to grasp that if the BNP are doing well (and that remains to be seen) the reason is more likely to do with false claims being made by minority groups, which then become widely believed. In this case, former Telegraph editor Charles Moore claimed the Muslim Council of Britain 'say that it is actually a good thing, an Islamic thing, to kill or kidnap British troops'. So apparently, those sentiments do not help the BNP. Trying to get those sentiments withdrawn does. For the record, the MCB said only a week ago that it: 'wishes to make clear that it no way supports the targeting or killing of British soldiers anywhere in the world'. It's a little hard to tell which part of this is meant to be a ' payout row' since we don't know what the payout will be, if there is to be one at all. But the Mail has delighted in whipping up some anti-Islam and anti-BBC 'outrage'. Charles Moore was said to be 'angered' and was not consulted on an apology, but then he does have form in making incorrect statements about Muslims in that Policy Exchange/Newsnight row.